Cuisine where taste and texture bond in a harmonious blend of colors. Not for those averse to challenging their palates. 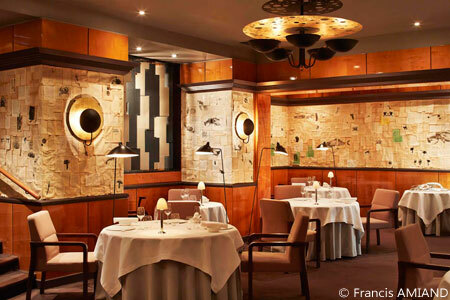 : Pierre Gagnaire came to Paris after ten years of hardship in Saint-Etienne, an industrial city near Lyon, where the talents resulting from his discovery of tastes were misunderstood and did not find the audience they deserved given his efforts. Settled in Paris, in a modern blond wood décor with soft lighting and comfortably spaced tables, Pierre Gagnaire combines taste and texture in a harmonious blend of colors. He rather sculpts than cuts. The dishware serves as a perfect canvas for his artistic work. Diminutive amounts of food are placed on large plates striped with aromatic sauces of various colors. The artistic inspiration of this cuisine necessitates that each dish be presented with its own format, as with the scallops and crab legs macerated in a peppery grapefruit juice. The sautéed squab is a more classical approach. But the truffle- and chocolate-enhanced parsnip purée can be disconcerting as is the slightly acid citrus infusion colliding with a sea bass marinière style (cooked with white wine), not to speak of the licorice milk served with the chicken liver cake. Pierre Gagnaire's rather baroque cuisine, abundant with so many fragrances and imaginatively presented, can sometimes satisfy the eye more than the palate. This approach will seduce those who love novelty --- maybe a little less the conservatives. A table for two within the kitchen allows guests to admire the brigade working during the services.